Do you want a safe new home for your chickens? 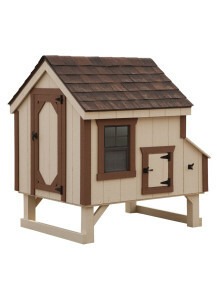 Then check out our many different styles & sizes of chicken coops. Our quality handcrafted coops are built by skilled craftsmen and made to fit everyone's budget. 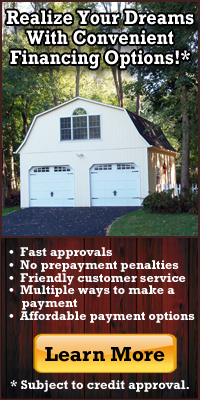 Feel free to customize any coop with our many options that are available. Families and children of all ages enjoy collecting fresh eggs everyday. 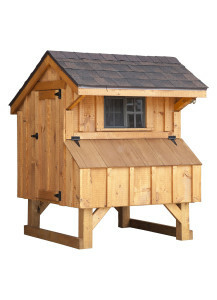 We know your chickens will enjoy their new home in our quality built chicken coop. You will enhance your backyard and be able to care for your chickens in style and comfort. Thanks for choosing our chicken coops. 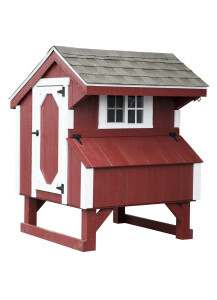 Our goal is to provide customer satisfaction in every chicken coop purchase. Hand-crafted 3x3 A-Frame duratemp chicken coop measures 3' by 3', stands 52" high and sits 12" off the ground. There are also three 1 foot wide by 1 foot deep nesting boxes. The capacity of this coop is 3 - 5 chickens. Each chicken coop is hand-crafted in the United States by expert Amish woodworkers and finished to order with your choice of siding color, trim color, door color and roof shingle color. You can also select an optional metal roof. Hand-crafted 3x3 A-Frame board and batten chicken coop measures 3' by 3', stands 52" high and sits 12" off the ground. There are also three 1 foot wide by 1 foot deep nesting boxes. The capacity of this coop is 3 - 5 chickens. Each chicken coop is hand-crafted in the United States by expert Amish woodworkers and finished to order with your choice of stain color and roof shingle color. You can also select an optional metal roof. Shown with optional green metal roof and heavy-duty wheel system. Hand-crafted 4x4 A-Frame duratemp chicken coop measures 4' by 4', stands 65" high and sits 14" off the ground. There are also four 1 foot wide by 1 foot deep nesting boxes. The capacity of this coop is 8 - 10 chickens. Each chicken coop is hand-crafted in the United States by expert Amish woodworkers and finished to order with your choice of siding color, trim color, door color and roof shingle color. You can also select an optional metal roof. Hand-crafted 4x4 A-Frame board and batten chicken coop measures 4' by 4', stands 65" high and sits 14" off the ground. There are also four 1 foot wide by 1 foot deep nesting boxes. The capacity of this coop is 8 - 10 chickens. Each chicken coop is hand-crafted in the United States by expert Amish woodworkers and finished to order with your choice of stain color and roof shingle color. You can also select an optional metal roof. 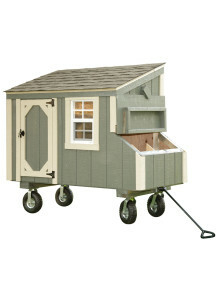 Shown with optional green metal roof and heavy-duty wheel system. Hand-crafted 3x4 quaker board and batten chicken coop measures 3' by 4', stands 70" high and sits 14" off the ground. There are also four 1 foot wide by 1 foot deep nesting boxes down the side. The capacity of this coop is 6 - 8 chickens. Each chicken coop is hand-crafted in the United States by expert Amish woodworkers and finished to order with your choice of stain color and roof shingle color. You can also select an optional metal roof. Shown with optional clean out lid and optional red metal roof. Hand-crafted 3x4 quaker duratemp chicken coop measures 3' by 4', stands 70" high and sits 14" off the ground. There are also four 1 foot wide by 1 foot deep nesting boxes down the side. The capacity of this coop is 6 - 8 chickens. Each chicken coop is hand-crafted in the United States by expert Amish woodworkers and finished to order with your choice of siding color, trim color, door color and roof shingle color. You can also select an optional metal roof. Hand-crafted 4x4 dutch-style duratemp chicken coop measures 4' by 4', stands 78" high and sits 14" off the ground. There are also four 1 foot wide by 1 foot deep nesting boxes down the side. The capacity of this coop is 8 - 10 chickens. Each chicken coop is hand-crafted in the United States by expert Amish woodworkers and finished to order with your choice of siding color, trim color, door color and roof shingle color. You can also select an optional metal roof.